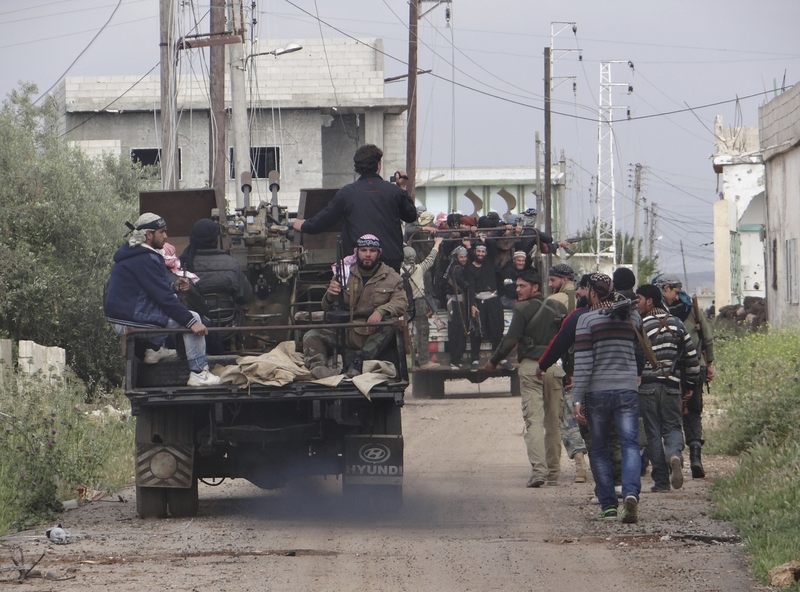 Rebels of the Free Syrian Army move toward the front line in Dera'a, Syria, on April 18. The battle for the city of Dera'a in southern Syria has become a test of an American pledge to give military support to rebels fighting Syrian President Bashar Assad. After a string of defeats, the rebels have scored rare victories around Dera'a. But in interviews,rebel commanders passing through neighboring Jordan say those gains could be lost without a dependable arms pipeline and promised U.S. support. Yasser Aboud, a thin, intense former colonel in the Syrian army, commands the joint operations center for southern Syria. "We have made excellent gains on the ground," he says, "liberating entire villages." Aboud explains that the rebels now control a significant area just north of the Jordanian border all the way to Al-Balad, a neighborhood in the historic district of Dera'a. 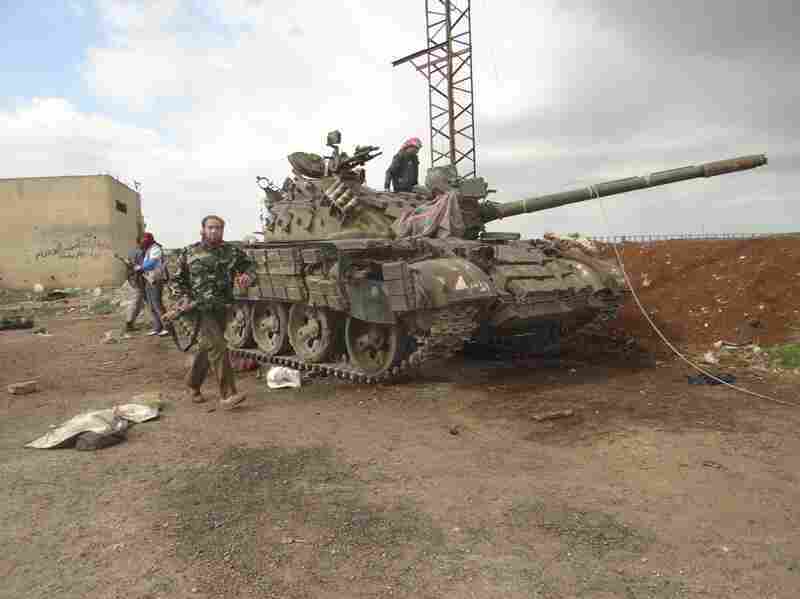 But the Syrian army has mounted a counteroffensive, he says. 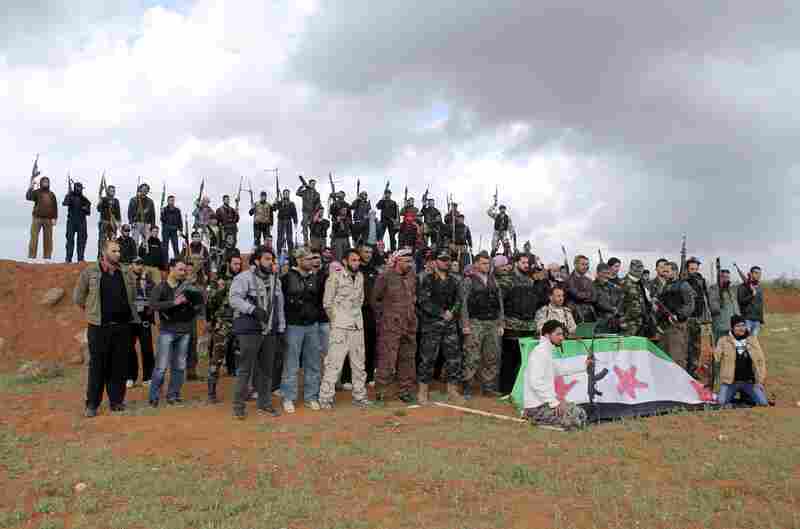 Free Syrian Army fighters after a battle against government troops in Zaizoon, near Dera'a, on Feb. 16. "In terms of shelling and bombing, it goes beyond daily, it's almost around the clock," he says. Aboud says the Syrian military now has reinforcements around the city. "We've seen Shiite fighters coming in from Lebanon, Iraq and Iran," he says, including the Lebanese Shiite militia, Hezbollah. This is a new phase of the war, says Aboud, who was one of the first army officers to organize a rebel unit in Dera'a in May 2011. He was ambushed and captured by regime forces in the city and says he somehow survived a point-blank attempt to execute him. "They placed a rifle by my right eye," he says, "and then they fired." The bullet went through his nose and right eye. He was left for dead on the street. He lost sight in the eye, yet he returned to Dera'a after 22 days in a Jordanian hospital. He is convinced that Dera'a has always been the most important battle front in Syria. "Dera'a is the most strategic front," he says. "Essentially, it's the closest one to Damascus." Rebel commander Mohammed al-Dehni agrees to meet at a rehab hospital in Jordan. The cost of the fight in southern Syria shows on the grim faces of rebels in wheelchairs and on crutches. Some will be bedridden for life. A colonel who defected from the Syrian army, Dehni leads a company in a 2,000-man rebel battalion. He says the rebels in the south have now organized into military councils, which may explain the recent successes. "It's an incremental liberation effort," Dehni says. "One checkpoint is liberated, then another and then another." When rebels recaptured the 8th-century Omari mosque in the historic district, Dehni had his picture taken in front of what was left. In March 2011, it was the gathering point for the first political protests against the Assad regime. In April 2013, Dehni says, 18 tank shells destroyed it. Now, Dehni is in Jordan. He wants heavy weapons to counter the regime's tanks. He says Saudi Arabia has been covertly arming rebels for months. But these days, he says, Americans have the final say on who gets the weapons, insisting they go only to moderate rebel groups — and not Islamist brigades. The rebels have scored rare victories around Dera'a. "They simply don't trust us at the moment, and the problem is that we are now frustrated by the fact that we have no guaranteed source of ammunition," he says. Many commanders say they are frustrated with the long vetting process by U.S. intelligence agents in Jordan, and a Saudi arms pipeline that is undependable. The military aid promised by President Obama in June has not arrived at all. "We're very disappointed with what's happening," says Ahmad Ne'meh, a former air force officer who now heads the rebel military council in Dera'a. Ne'meh and other commanders say the U.S. and its allies have been assisting with training and intelligence sharing. Some nonlethal aid arrived two months ago. "We did receive logistical support in terms of bulletproof vests, night vision goggles and security communication devices," he says. To get the nonlethal U.S. gear, rebel fighters have to prove they are not Islamists. Every battle must be documented for U.S. agents at an operations room in Jordan, Ne'meh says. Other commanders confirm the process. "Yes, we have been having people state on video that they've been receiving this logistical support," Ne'meh says. But it's not enough to challenge the dynamics against Syria's army, says Ne'meh, especially with reinforcements from Iran and Hezbollah. Rebels have pleaded with the U.S. and international backers to open up the arms pipeline through Jordan and send anti-tank and anti-aircraft weapons soon. "We have communications with the Americans. They are our friends and allies. We just hope to get something proper from them," Ne'meh says. "Why the delay?" In June, rebels blew up two high-rise buildings that flanked a key army post in Dera'a and claimed the city was about to fall to the rebels. But now, the gains are in doubt, says Dehni, the rebel commander, after his failed mission to get resupplied in Jordan. "Liberate Dera'a? Look, we are not receiving the weapons we need or the ammunition that we need," he says. With rebels losing ground across Syria, the outcome in Dera'a is crucial. Syria's political opposition leaders have rejected negotiations sponsored by the U.S. and Russia until the rebels are stronger on the ground. "It is also our bad luck that this has come after Afghanistan and after Iraq, and now American society is very careful, maybe too careful," Dehni says.